German organic chemist who invented an apparatus for determining vapour densities, used to calculate molecular weights. Viktor Meyer was a German organic chemist best known for the method of determining vapour densities (and hence molecular weights) named after him. He was also the discoverer of the heterocyclic compound thiophene. Although Jewish by birth, he was brought up quite free from Jewish beliefs and ritual. He was eventually confirmed in the reformed Jewish church but married a Christian and brought up his children in this religion. His parents were not anxious to have him study chemistry but permitted him, in 1865, to attend the University of Berlin just after Hofmann had assumed the chair of chemistry there. He stayed there one semester and then went to Heidelberg and worked under Robert Bunsen, hearing lectures in organic chemistry by Emil Erlenmeyer. He received his doctor's degree in 1867, at the age of nineteen, no research being required under Bunsen at that time. He became Bunsen's assistant and analyzed mineral waters for a year, meanwhile helping students to prepare for their examinations. Then he turned to organic chemistry and worked under Johann von Baeyer at the Gewerbe Schule in Berlin. In 1871, he became professor of organic chemistry at the polytechnic school of Stuttgart, but the next year he progressed to the Zurich Polytechnicum, where his students were often older than the professor. There he accomplished numerous researches in organic chemistry which were characterized by much originality, discovering, for example, thiophene in benzene (1882), which had not only been missed by other experimenters, but the indophenin reaction, due to the presence of thiophene, had been hitherto regarded as a characteristic test for benzene. In 1876 he began to reach into the field of physical chemistry and devised a new method for the determination of gas density in 1878. This convenient method enabled him to show that arsenious oxide vapours corresponded to the formula As4O6, that mercury and cadmium yielded monatomic vapours, and that halogen molecules dissociated into atoms on heating, a phenomenon which he continued to study up to his death. Viktor Meyer's apparatus for measuring vapour density. In 1884, with the American F. P. Treadwell (1857-1918) he published Tables for Qualitative Analysis. In the next year, 1885, Meyer was called to Gottingen after the death of Hübner (1837-1854), the successor to Friedrich Wöhler. Here he had so many students that the old laboratory became much too small, and it was necessary to build a new one. Meyer was one of the first to take up van't Hoff''s theory of the asymmetric carbon atom, and he became interested in the stereochemistry of nitrogen and the testing of the Hantzsch-Werner theory. In 1888, Bunsen decided to retire from his professorial chair at Heidelberg and chose Viktor Meyer as his successor. After some difficulties were overcome, Meyer was able to leave Gottingen for Heidelberg. There, during the next nine years, he carried out with his students many brilliant pieces of work, partly with gases, as in studying the equilibrium between hydrogen, iodine, and hydrogen iodide, but chiefly in the field of organic chemistry. In 1892 he astonished the chemical world with his discovery of the iodoso compounds which showed great reactivity with respect to the ease with which the IO group changed to IO2 (the iodo group). Soon after the discovery of o-iodobenzoic acid, he noticed what he called steric hindrance; benzoic acids with a substituent in the ortho position are esterified with difficulty, if at all, by treatment with hydrochloric acid in alcohol. Meyer's Lehrbuch den organischen Chemie, which he published with Paul Jacobson (1859-1923), is one of the best books of the kind ever published. Personally, Meyer was very attractive and his lectures were admired greatly. His accomplishments were remarkable, and he exerted a great influence upon the development of chemistry during the last half of the nineteenth century. He overtaxed his strength, however. The long period of working with iodine and bromine at high temperatures undermined his health. During the last years of his life, he was often ill and frequently had to resort to drugs in order to sleep. 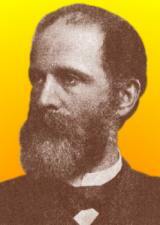 Finally, in a fit of depression, Meyer committed suicide by taking cyanide, and died at the age of 49 on 8 August 1897. A History of Chemistry, F.J. Moore rev. by William T. Hall, 3rd Ed, McGraw-Hill Book Company, 1939. The Hutchinson Dictionary of Scientific Biography, Ed. Roy Porter, 2nd Ed., Helicon Publishing Ltd.,1994. 8 Sep - short biography, births, deaths and events on date of Meyer's birth.